Spandidos Publications journals utilize an online submission and tracking system designed to provide a faster, more efficient service to authors. The principal aim of Spandidos Publications is to publish promptly original works of high quality in English. Manuscripts will be considered on the understanding that they report original work, or are review articles summarizing and interpreting progress in a thematic area and are not under consideration for publication by another journal. Manuscripts should be written in clear, concise English and should contain all essential data in order to make the presentation clear and the results of the study replicable. Authors who are not native speakers of English but would like to improve the English to ensure the meaning is clear can make use of the English Language Editing service offered by Spandidos Publications by accessing the following link. All material submitted will be subject to review by appropriate referees selected by the Editorial Office and will be examined to detect inappropriate use of previously published material without attribution. Spandidos Publications utilizes iThenticate to screen submitted manuscripts against published studies and other relevant sources. iThenticate may also be utilized by authors to screen a manuscript prior to submission. Figures submitted will be subject to checks using the MOTUIN image authenticity detector. The Editors reserve the right to improve the grammar and style of manuscripts. The corresponding author is responsible for the submission on behalf of all authors. Prior to submitting your manuscript, please ensure that it has been prepared according to the guidelines below. Manuscripts may be submitted only by using the online submission system accessible via our website. Create a user account, log in and follow the onscreen directions. Summarize briefly the important points of the submitted work including a brief description of the study to be submitted, that it is an original study presenting novel work, that it has not been previously submitted to or accepted by any other journal, that is has been approved by all authors, that ethics approval and written informed consent have been obtained, and explain whether any author has a conflict of interest. Times New Roman. Font size 12. Spacing 1.5. Alignment Justified. Use a single tab on the first line of each new paragraph. Do not use page breaks or multiple returns between sections (one section should directly follow the previous one on the page). Sub-titles and general headings should be presented in lower case letters (not capitals). The title of the manuscript in sentence case. No abbreviations other than gene names or in common use. Full names and full postal addresses, but not including street names, of all authors and ORCID if desired. Affiliations of the authors indicated by numbers (not symbols). Equal contribution, if applicable, indicated by asterisk. Name, full postal address, including street number and name, and e-mail address of the corresponding author(s). Key words (5 – 10). Running title preceded by the first author’s name (maximum 100 characters with spaces, including the author’s name). 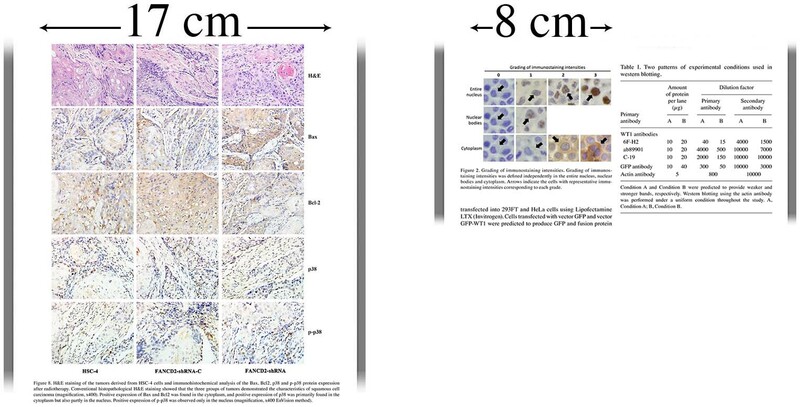 For example: PEARSON et al: REGULATION OF HER2 EXPRESSION BY NASCENT GROWTH FACTORS..
Abstract. This section should have 150‐300 words, be continuous (not structured) and without reference numbers. Abbreviations that appear once only, should be defined in full, with the exception of gene names. If abbreviations appear more than once, the definition should be provided once, and then subsequently used throughout the Abstract. Introduction. The information in this section should always be referenced. This section should include sufficient technical information to allow the experiments to be repeated. This implies that a full description of all the experiments described in Results and presented in the Figures/Tables is expected in this section. For each experiment, all steps (e.g., DNA and protein extraction, quantification, cloning, PCR and microscopy) need to be mentioned, along with instruments the analyses were performed on, reagents and methods (e.g., BCA method for protein quantification, ΔΔCq method for qPCR), and relevant citations. For steps performed with commercialized kits, provide the full name of the kit, along with the full name and location (city, province or state if USA/Canada, and country) of the supplier, and state whether the protocol of the manufacturer was followed or explain any modifications made to the standard protocol. For PCRs, provide name of the kit used, the 5’-3’ sequence of the primers, final concentration of all reagents in the reaction and cycling conditions. Carefully review your text to ensure that the type of PCR, quantitative or semi-quantitative, is clearly explained. If the PCR is performed using cDNA synthesized from RNA samples by reverse transcription (RT), make sure that all steps are described, and refer to the method as RT-PCR or, if quantitative, as RT-qPCR. In relative quantification, ΔΔCt is referred to as ΔΔCq. When using the ΔΔCq method, this must be referenced. One suitable reference is: Livak and Schmittgen: Analysis of relative gene expression data using real-time quantitative PCR and the 2-ΔΔCq method. Methods 25: 402-408, 2001. Manufacturers/suppliers/software details need to be provided for all reagents used (including chemicals), instruments (e.g. thermal cyclers, microscopes) and software, ideally accompanied by the c orresponding kit number/model/version. For antibodies, include the type (monoclonal/polyclonal), species in which they were raised and targeted species (e.g., mouse anti-human), explain any antigen retrieval steps, mention the dilution used, and state the catalogue number and supplier. Please also state the temperature and duration of incubation. For centrifugation steps, provide centrifugal force units in x g rather than revolutions per minute (rpm). For bioinformatic analyses: state the software used along with the relevant citation, unless the software is not published, in which case a website link can be provided. For microarray/RNA sequences, data downloaded from GEO or other databases, this needs to be clarified in the text, along with the corresponding accession number of the dataset. The use of software should be described with regards to the parameters (default, study-specific) and the applied thresholds; please explicitly name the parameters, e.g. ‘association value’ or ‘false-positive rate’. For all software analysis of data from public databases, cite the database (along with date of access for databases as these are constantly updated), and species (e.g., human). If Figures/Tables contain data from a public database (e.g., Gene Ontology/KEGG), cite the source in the legend/title explicitly. For publically available sequences, provide the accession number. The source of material used and relevant ethical framework for all experiments should be clearly identified (ethics approval and/or written informed consent). For tissues, explain how these were collected, handled and stored, and where they were from. For bacterial strains or cells, provide the name and supplier. For studies on humans, a minimum of information is required: number of subjects, age range, gender ratio, health status, matching between controls and disease patients with regards to the above parameters. Please note that ‘normal’ should be avoided for controls; rather, the precise health status needs to be described, e.g., ‘healthy’, or ‘individuals with no recorded tumor complication’. For manuscripts presenting studies on humans and animals, see 3.8 below. For statistical analyses: when statistical analyses have been performed, the following information should be provided: the name of the statistical test used, the n number for each analysis, the comparisons of interest, the alpha level and the actual P-value for each test. It should be clear which statistical test was used to generate every P-value. Error bars on graphs should be clearly labeled, and it should be stated whether the number following the ± sign is a standard deviation or a standard error. The word ‘significant’ should only be used when referring to statistically significant results, and should be accompanied by the relevant P-value. 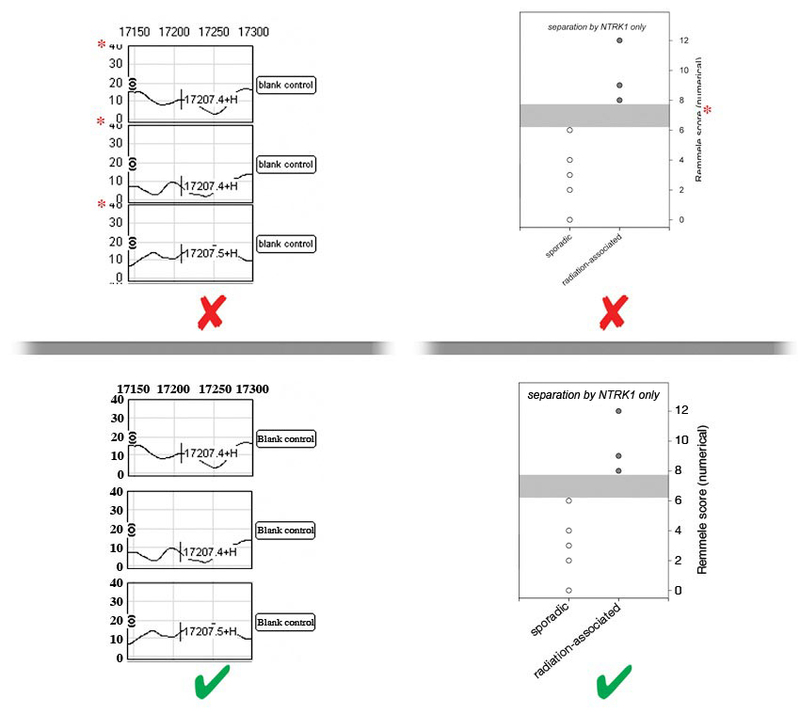 Significance indicators should be used on graphs and tables, and should be described in the figure or table legend, clearly indicating which groups are being compared. Please note that Figure legends are not expected to contain information already described in Materials and methods, except for image-specific information, for example, for microscopy, mention the type of image, e.g., fluorescence and the original magnification if scale bars are not used. Legends should provide information concerning what is shown in the figure(s)/figure parts. The x- and y-axes of the graphs must be clearly explained in the legends, and when P-values are provided to indicate probability, the comparison to which these P-values refer must be clearly stated. If cell lines are used, authors are strongly encouraged to include the following information in the materials and methods section of their manuscript: i) Confirm that mycoplasma testing has been done for the cell lines used; ii) confirm that the cell lines used have been authenticated and state what method was used for the authentication; and iii) provide the source, supplier and, if available, catalogue number of all specific cell lines used in the study. The authors are strongly encouraged to submit a detailed methodology stating the maintenance and culture of cell lines according to international guidelines on good cell culture practice (fundamental techniques, mycoplasma contamination, passage number, etc.). Furthermore, information regarding misidentified or cross-contaminated cell lines must be provided and cross-checked from the International Cell Line Authentication Committee and ExPASy Cellosaurus databases in order to exclude their contamination with other cell lines or their incorrect identification. 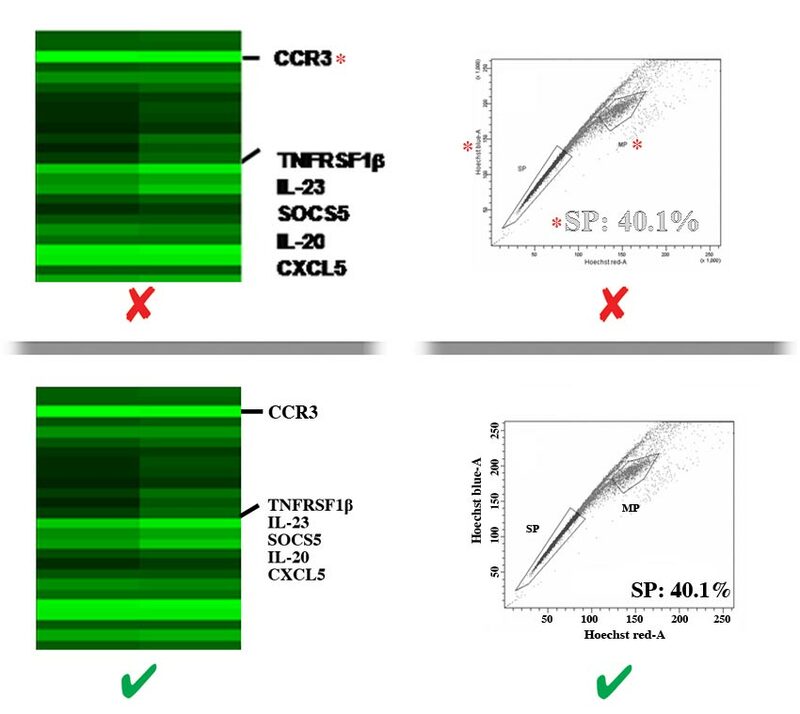 If a cell line has been previously reported to be contaminated or misidentified, an STR profile of the cell line used in the study must be available for evaluation by the journal’s editor. Abstract. This section should have 150‐300 words, be continuous (not structured) and without reference numbers. May have different sections and sub-headings according to the subject matter. The main headings of the review should be summarized as a numbered Contents section immediately following the Abstract. Submission of figures to us implies that the images or parts thereof have not been published elsewhere (unless mentioned and/or cited in the text and permission has been obtained and provided to us). Images showing any patient or patient’s scans should not contain information that might identify them, unless you provide written permission from the patient allowing use of the specific image. We accept that figures in our journals are rarely simple, and that certain adjustments are acceptable to help show experimental results clearly. The guiding principle when preparing digital artwork should be to ensure that the version submitted to us is an honest and accurate representation of the original observation(s) and will not lead to possible misinterpretation of what was done experimentally. The Editors may assess submitted images for unacceptable manipulation using forensic tools and other means. This might delay progress of your manuscript and/or lead to further investigations and action to preserve the integrity of the scientific record, such as not accepting or revoking a manuscript. We may request the original unmanipulated source files and may contact the author’s institution for assistance with enquiries to establish probity. Our guidance builds on that described by Rossner and Yamada (1). If brightness, contrast or colour balance is altered, the change should apply to the entire image shown and not a selected part. For images from gels or filters, ensure that details are not lost from bright areas or obscured in dark areas. No feature of a data image should be selectively enhanced, obscured, removed or added. If a composite image shows gels or blots with tracks from groups of samples analysed separately (or from different exposures) then make the grouping obvious using black or white lines and explain this in the figure legend. The boundaries of individual panels of a tiled image should be marked. In the Methods or individual figure legends outline the changes you made to images and how. For example, “Figure 99. Light microscopy of a frozen section of a lesion stained with toluidine blue. Original magnification x100. Uneven illumination was corrected using a control image as described by Marty GD (2)”. (1) Rossner M and Yamada KM: What's in a picture? The temptation of image manipulation. J Cell Biol 166: 11-15, 2004 (http://jcb.rupress.org/content/166/1/11). (2) Marty GD: Blank-field correction for achieving a uniform white background in brightfield digital photomicrographs. BioTechniques 42:716-720, 2007 (https://www.ncbi.nlm.nih.gov/pubmed/17612294). TIFF without layers and preferably using Lempel–Ziv–Welch (LZW) compression as it does not reduce image quality. JPEG (only if originally saved at the highest quality). BMP, GIF, PCT, PNG or low quality JPEG files originally saved at low quality. Color figures: Use RGB as this will offer the best reproduction of your data in the final PDF version of your article on screen. CMYK mode is also acceptable. Fluorescence images must be submitted for publication in color. Black and white figures and line art: grey scale mode or RGB mode. Combination figures with colour images and line art: RGB mode. Color figures are welcome but must be submitted only if reproduction in color is intended (a charge will apply). There is a charge of Euro 390 per each published page containing color. Changing color figures to black and white following evaluation is NOT possible. Empty white space surrounding a figure should NOT be included when calculating image size. Images should therefore be cropped (cut) as close to the outside edges of the figure as possible. If a figure is too wide or contains too much information to be fit within 17 cm while keeping details clearly visible, figures must be divided into several clearly labeled separate parts. Image resolution in this context is simply a measure of the number of pixels per inch (also called dots per inch, dpi) defining the image and does not relate to the quality of an image in terms of focus, contrast and legibility. Images must be clear, of good contrast and legible at the size they are to appear in the journal. Images should be AT LEAST 300 dpi, at the size at which they will be printed (8 or 17 cm wide). Insufficient image size and/or resolution (dpi) will result in poor quality (blurred) printed figures if they are upscaled. Figures may be produced by scanning, digital photography, or exporting from scientific software or a program such as PowerPoint. use a good quality scanner set to scan in RGB for color images or grey scale for line art or to scan gel images, at a resolution of at least 300 dpi and with the output file type set preferably to TIFF, or JPG highest quality (lowest compression). Set simple cameras to a ‘fine’ or ‘extra fine’ setting to help ensure that images have sufficient pixels. When exporting from scientific graphing software, choose settings to ensure the highest possible final size and resolution with lines of sufficient thickness to be seen at final printed size. When exporting from PowerPoint, DO NOT choose ‘Save as TIFF’ from the Save as dialogue box as this will NOT result in an image of sufficiently high resolution. Instead, save the individual slide image as a PDF (from the Print dialogue box), THEN open the PDF with image editing software, such as Photoshop or GIMP, and when prompted specify 300 dpi resolution. Finally, save the resulting image as a TIFF (with LZW compression). Note: figures initially scanned, photographed or exported at an insufficient size and resolution cannot be improved by upscaling, i.e., artificially increasing the resolution of a low-quality figure. Using image-editing software to keep the figure size the same while raising the dpi will NOT improve its quality. If saved according to our guidelines, files will rarely exceed 10 MB. Ensure figures are the exact width and height they should be for publication (not smaller), make sure the figures are saved at no more than 300 dpi. Ensure that layers in the image have been flattened. Save black and white figures as grey scale. Ensure that TIFF are saved with LZW compression. Consider saving files as highest quality JPEGs. These may be smaller files than TIFF with LZW compression, but will lose some detail. Try using a compression or stuffing utility, such as WinZip or StuffIt. Labels must be sized in proportion to the image, sharp and clearly legible. When figures are prepared at the correct size (8 or 17 cm at 300 dpi) the font size for labels should be 8‐10 points. If the figure is saved at a size larger than that needed for printing, the font size of labels must also be larger to maintain the correct proportions. If labels cannot fit on an 8‐cm‐wide page unless the font size is smaller than 8 points, the figure must be prepared as a double column figure (14‐17 cm wide). If labels cannot fit on the 17‐cm‐wide page unless the font size is smaller than 8 points, the figure must be split into several parts. Labels must be saved using standard fonts (Times New Roman, Times, Arial, Helvetica or Symbol font). The labels should be of the same font and size in all figures. Also, the numbering should be of the same font and size in all figures. Labels should be evenly spaced and aligned, easy to see (including exponential numbers around figure axes), and NOT faded, broken, or distorted by JPG compression artifact. Do NOT use light grey color lines or labels. There must be strong contrast between labels and their background (e.g., labels placed over shaded bar graphs should be in a color that stands out against the shading, NOT blend in with it). Whenever possible, labels should be placed in black font on a white background. Consider using a black label with a white stroke applied to create contrast. Letters of labels must NOT be overlapping, condensed, expanded, have unnecessary gaps between them or be otherwise irregularly spaced, and must NOT be stretched (distorted) horizontally or vertically. Labels must NOT overlap or be concealed by other parts of the image, or be cropped (cut off) by the edge of the figure. Labels must be prepared according to our in‐house style, be phrased in accordance to the manuscript, and free of spelling and other language errors. The first letter of each phrase, NOT each word, must be capitalized [e.g., ‘Overall survival (months)’ not ‘Overall survival (months)’ and not ‘overall survival (months)]’. Always use a leading zero (0) before decimal points: 0.5 NOT .5. Decimal points must use a full stop/period (.) NOT a comma (,). A space must be inserted before measurement units: 132 bp NOT 132bp, 5 mm NOT 5mm, 1 h NOT 1h. Figures may be divided into separate sections. Each section may be saved as a separate file (clearly indicated in file name) or included together in one file (with parts clearly labeled). Separate parts of a figure should be labeled using just A, B, C, NOT 1A, 1B, 1C. The number of the figure must NOT be included in the image, especially if placed on the overlapping part of the image. Instead, the file itself should be named using the figure number. 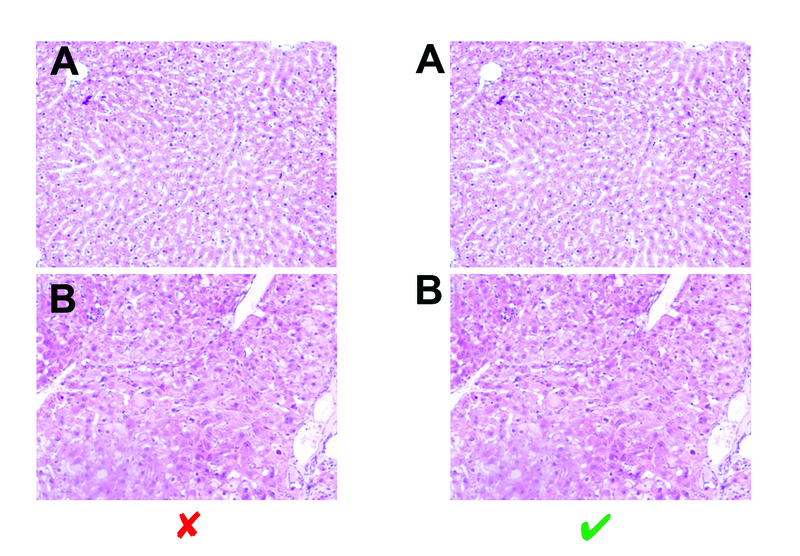 A, B, Cs must be placed to the top left of each section of the figure, NOT overlapping the image. Figure backgrounds must be white. Grey backgrounds (or backgrounds of any other color) are NOT acceptable. White space surrounding figures should be cropped so that the image is as close to the edges of the page as possible. Figures and specific sections of figures should NOT be surrounded by borders (frames). Figures should NOT be stretched out of proportion (distorted) horizontally or vertically. Yellow must NOT be used for lines in diagrams. Any darker color may be used instead. Line art should be dark, and lines and labeling thick enough to be clearly visible, even at small sizes. Charts, graphs and diagrams should NOT use more than 5 shades of grey. Patterns are acceptable. In charts, graphs and diagrams, unnecessary colors should be avoided (e.g., color that does not impart any additional information and is used for slight emphasis only, or color that can be replaced by shades of grey, patterns or shapes). If a figure or table has been published previously (even if you were the author of the manuscript), copyright permission for re-use of the figure or table will often be required. You must acknowledge the original source and submit written permission from the copyright holder to reproduce the material where necessary. As an author of your manuscript, you are responsible for obtaining permissions to use material owned by others. Figure legends should be listed one after the other, as part of the text document and separate from the figure files. Figure legends must begin with a brief title for the whole figure and continue with a short description of each panel or part. All symbols (eg. asterisks, hashtags) used to indicate significant differences in the figures must be defined accordingly in the figure legend. All error bars must be defined in the figure legend. Legends should not contain any details of the methods. Each table should be submitted on a separate Word file. Times New Roman. Font size 12. Spacing 1.5. Label using Roman numerals, i.e. Table I, Table II, etc. All symbols and abbreviations should be defined immediately below the table. Supplementary data and other materials can now be submitted to all of our journals to support and enhance research manuscripts. The material should be directly relevant to your paper and can include information in the form of audio, video, tables and figures. Supplementary data should be submitted together with the original manuscript, as these data will undergo the peer review process as well. Acceptable file types are: JPG, JPEG, EPS, TIFF, TIF, DOC, DOCX, ODT, ODF and for video/audio: MKV, MOV, AVI, MPG, MPEG, MP4. Naming of chemicals should follow that given in Chemical Abstracts Service. Use standard abbreviations where possible. Use the generic name of any drug unless making claims about a specific brand or formulation. New abbreviations must be defined at first usage. Manuscripts submitted to Spandidos Publications must contain adequate data to support their assignment of identity and purity for each new compound described in the manuscript. Authors should provide a statement confirming the source, identity and purity of known compounds that are key in their study, even if they are purchased or resynthesized using published methods. Chemical identity for organic and organometallic compounds should be established through spectroscopic analysis. Standard peak listings for 1H-NMR and proton-decoupled 13C-NMR spectra should be provided for all new compounds. Other NMR data such as 31P-NMR or 19F-NMR should be reported when appropriate. For new materials, authors should also provide mass spectral data to support molecular weight identity. UV or IR spectral data may be reported for the identification of characteristic functional groups, when appropriate. Melting-point ranges should be provided for crystalline materials. Specific rotations may be reported for chiral compounds. For known compounds, references rather than detailed procedures should be provided, unless the authors followed a modification of the published methods. Standard characterization data for a diverse panel of library components should be included in manuscripts describing the preparation of combinatorial libraries. If direct structural analysis of new biopolymeric materials (e.g. oligosaccharides, peptides, nucleic acids) by NMR spectroscopy is not possible, authors must provide evidence of identity based on sequence (when appropriate) and mass spectral characterization. Authors should be able to provide sequencing or functional data that validates the identity of their biological constructs (plasmids, fusion proteins, site-directed mutants) upon request. Evidence of sample purity must be shown for each new compound. For organic and organometallic compounds, purity may be demonstrated by high-field 1H-NMR or 13C-NMR, while elemental analysis is encouraged for small molecules. Quantitative analytical methods, including chromatographic (e.g. GC, HPLC) or electrophoretic analyses may be used for small molecules and polymeric materials. Detailed spectral data for new compounds should be provided in the Materials and methods section. Figures containing spectra must be made available to the Editor upon request. The authors should explain how specific, unambiguous NMR assignments were made in the Materials and methods section. 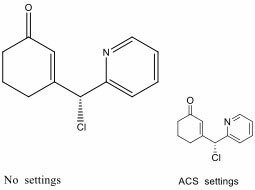 Authors reporting new structures of small molecules from crystallographic analysis must be able to provide a standard crystallographic information file (.cif); structure factors for each structure; and a structural figure with probability ellipsoids upon request. The structure factors and structural output should be checked using International Union of Crystallography checkCIF. Crystallographic data for small molecules should be submitted to the Cambridge Structural Database, and the deposition number must be referenced in the manuscript. 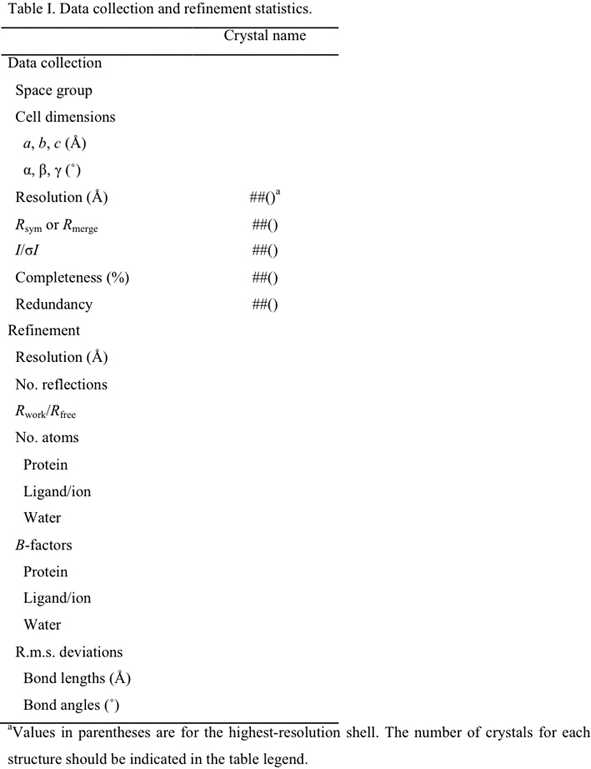 Manuscripts reporting new structures should contain a table summarizing structural and refinement statistics, and the different programs used in the analysis should be mentioned and referenced. To assess the quality of the structural data, a stereo image of a portion of the electron density map (for crystallography papers); of the superimposed lowest energy structures (>10; for NMR papers); or of the entire structure (as a backbone trace) if the reported structure represents a novel overall fold should be provided upon request. For cryo-EM structures, a representative micrograph showing individual particles should be provided at submission. Protein structures should be deposited in the Protein Data Bank PDB and the deposition number must be referenced in the manuscript. Figure 1: Representative molecule and lettering in ChemDraw default (left) and ACS (right) format. Spandidos Publications has updated its services by incorporating Edifix, a new program that automatically links and corrects bibliographic references. Based on our particular style, the first 9 authors will be listed as they appear. When more than 10 authors are listed, Edifix will automatically include only the first 10 authors, followed by et al. Cite journal titles using NLM Title Abbreviation found in the U.S. National Library of Medicine Catalog online. References must be numbered consecutively in the order mentioned. Do NOT use full stop after initials or abbreviations. In the text, cite references by number in parentheses e.g., (1-3) (1,2). Inclusive page numbers should be given. 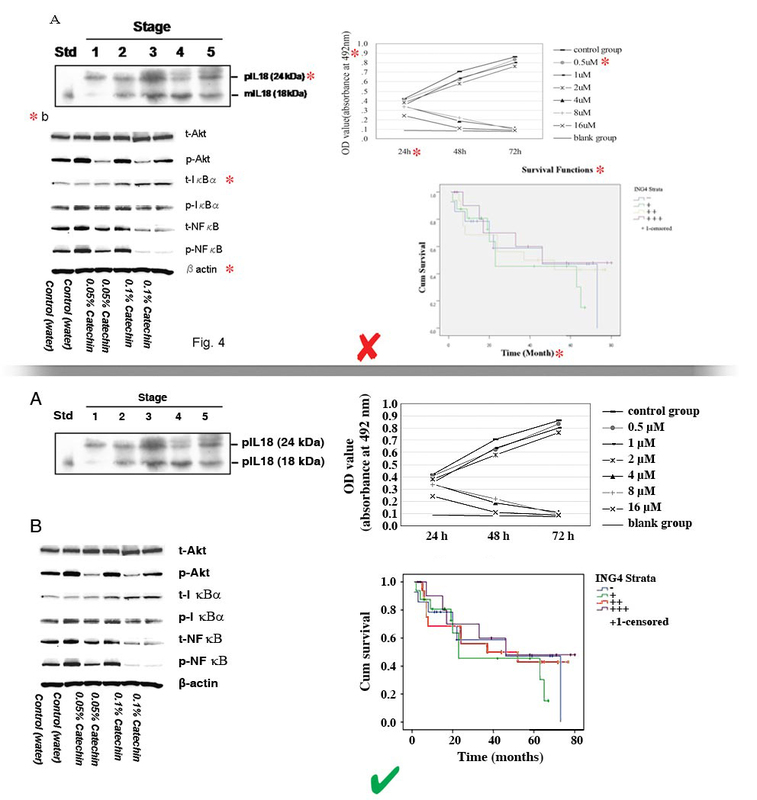 Spandidos DA and Wilkie NM: Malignant transformation of early passage rodent cells by a single mutated human oncogene. Nature 310: 469-475, 1984. Spandidos A, Wang X, Wang H and Seed B: PrimerBank: A resource of human and mouse PCR primer pairs for gene expression detection and quantification. Nucleic Acids Res 38: D792-D799, 2010. Barbu CG, Arsene AL, Florea S, Albu A, Sirbu A, Martin S, Nicolae AC, Burcea-Dragomiroiu GTA, Popa DE, Velescu BS, et al: Cardiovascular risk assessment in osteoporotic patients using osteoprotegerin as a reliable predictive biochemical marker. Mol Med Rep 16: 6059-6067, 2017. Hall A, Morris JDH, Price B, Lloyd A, Hancock JF, Gardener S, Houslay MD, Wakelam MJO and Marshall CJ: The function of the mammalian Ras proteins. In: Ras oncogenes. Spandidos DA (ed.) Plenum Publ. Corp., New York, pp99-104, 1989. Manuscripts in preparation or submitted (but not yet accepted) and abstracts, may be cited in the text, but should NOT be included in the list of references. Output Style files are available to download in Endnote format from Spandidos Publications or from Clarivate and also in CSL 1.0.1 format from here to work with software such as Mendeley, Papers and Zotero (www.zotero.org) . All contributors who do not meet the criteria for authorship should be listed in an ‘Acknowledgements’ section. Examples of those who might be acknowledged include a person who provided purely technical help or writing assistance, or a department chair who provided only general support. The involvement of scientific (medical) writers or anyone else who assisted with the preparation of the manuscript content should be explicitly acknowledged, along with their source of funding, in the ‘Acknowledgements’ or ‘Authors’ contributions’ section as appropriate. Authors should obtain permission to acknowledge from all those mentioned in the Acknowledgements section. If you do not have anyone to acknowledge, please write "Not applicable" in this section. All sources of funding for the research reported should be declared. The role of the funding body in the design of the study, collection, analysis and interpretation of data, and manuscript writing should be declared. If a funder name is not applicable, please state so in your manuscript as follows: “Funding information is not applicable”/”No funding was received”. Submission of a manuscript to Spandidos Publications implies that the materials included in the manuscript, including all relevant raw data, may be made freely available to any researchers who wish to use them for non-commercial purposes, while preserving any necessary confidentiality and anonymity. For our journals, we strongly encourage that all datasets on which the conclusions of the paper depend should be available to readers, unless they are already provided as part of the submitted article. Where datasets are included in the study, authors should include an “Availability of data and materials” section in the article, stating where the data supporting their findings may be found. Authors who do not wish to share their data must state this fact, and also provide an explanation as to why the data are unavailable. The datasets generated and/or analyzed during the current study are available in the [NAME] repository, [PERSISTENT WEB LINK TO DATASETS]. The datasets generated and/or analyzed during the current study are not publicly available due to [REASON WHY DATA ARE NOT PUBLIC] but are available from the corresponding author on reasonable request. Authors are encouraged to deposit their datasets in publicly available repositories, where available and appropriate. Publicly available datasets must be fully referenced in the manuscript with an accession number or unique identifier such as a digital object identifier (DOI). We leave the selection of the repository entirely to the author’s discretion, although note that the data must be freely available to readers. A list of recommended repositories is featured below; consulting the Registry of Research Data Repositories may also be useful in this regard. Please note that an 'author' is generally considered to be someone who has made substantive intellectual contributions to a published study. According to the ICMJE guidelines, to qualify as an author one should have i) made substantial contributions to conception and design, or acquisition of data, or analysis and interpretation of data; ii) been involved in drafting the manuscript or revising it critically for important intellectual content; iii) given final approval of the version to be published. Each author should have participated sufficiently in the work to take public responsibility for appropriate portions of the content; and iv) agreed to be accountable for all aspects of the work in ensuring that questions related to the accuracy or integrity of any part of the work are appropriately investigated and resolved. Acquisition of funding, collection of data, or general supervision of the research group alone, does not usually justify authorship. Please note that changes to authorship cannot be made after acceptance of a manuscript. If any changes to the list of authors of a manuscript are necessary after the initial submission but before publication, the corresponding author must contact the journal staff and provide a clear reason for the change. If the change to the authorship list is appropriate and in keeping with the guidelines given above, the corresponding author will be asked to provide written confirmation that all other authors listed on the manuscript at that time consent. Spandidos Publications will individually inform anyone who is added or removed from the author list. Manuscripts reporting studies involving human participants, identifiable human data or human tissue must include a statement on ethics approval and consent (even where the need for approval was waived), as well as the name of the ethics committee that approved the study and the committee’s reference number if appropriate. Similarly, studies involving animals must include a statement on ethics approval. If a study was granted an exemption from requiring ethics approval, this should also be detailed in the manuscript (including the name of the ethics committee that granted the exemption). Further information and documentation to support this should be made available to the Editor on request. Please note that manuscripts may be rejected if the Editor considers that the research has not been carried out within an appropriate ethical framework. Furthermore, please bear in mind that, if a study was not granted ethics committee approval prior to commencing, retrospective ethics approval usually cannot be obtained and it may not be possible to consider the manuscript for peer review. The decision on whether to proceed to peer review in such cases is at the Editor's discretion. In case of clinical trials, which are defined as "any research study that prospectively assigns human participants or groups of humans to one or more health-related interventions to evaluate the effects on health outcomes", the trial registration number (TRN) and date of registration should be included as the last line of the manuscript abstract. Suitable publicly available registries are those listed on the ICMJE website and the WHO International Clinical Trials Registry Platform. For clinical trials that have not been registered prospectively, Spandidos Publications encourages retrospective registration to ensure the complete publication of all results. In such cases, the TRN, date of registration and the words 'retrospectively registered’ should be included as the last line of the manuscript abstract. Research that is performed on humans should follow international and national regulations in accordance with the Declaration of Helsinki, or any other relevant set of ethical principles. For all research involving human subjects or tissues, the manuscript should include a statement declaring that informed consent for participation in the study or use of their tissue was obtained from all participants (or their parent or legal guardian in the case of children under 16). With regard to the use of experimental animals, any research performed must follow internationally recognized guidelines on animal welfare, as well as local and national regulations, in accordance with the U.K. Animals (Scientific Procedures) Act and associated guidelines, the EU Directive 2010/63/EU for animal experiments, or the National Institutes of Health guide for the care and use of laboratory animals for the care and use of laboratory animals. All animal studies should also comply with the ARRIVE guidelines and the AVMA euthanasia guidelines 2013. A statement must be included in the manuscript, identifying the institutional and/or licensing ethics committee that approved the experiments undertaken, including the reference number where appropriate. The ethics committee from which approval is obtained must be transparent in its functioning, independent of the researcher, the sponsor and any other unwarranted influence and duly qualified. If a study was granted an exemption from requiring ethics approval, this should also be detailed in the manuscript (including the name of the ethics committee that granted the exemption and the reasons for the exemption). The Editor will take account of animal welfare issues and reserves the right to reject a manuscript, especially if the research involves protocols that are inconsistent with commonly accepted norms of animal research. Patients have a right to privacy that should not be violated without informed consent. Identifying information, including names, initials, date of birth or hospital numbers, images or statements should not be included in the manuscript unless the information is essential for scientific purposes and the patient (or parent or guardian) has provided written informed consent for publication. A statement must be included in the manuscript declaring that the patient, or parent, guardian or next of kin (in case of deceased patients) provided written informed consent for the publication of any associated data and accompanying images. The consent form must be made available to the Editor if requested, and will be treated confidentially. For case reports or other studies in which case details, personal information or images are included that may enable an individual to be identified, the individual or a parent, guardian or next of kin must consent to its publication, and this consent should be declared in the manuscript. Authors should disclose to patients that personally identifiable material would be available via the Internet as well as in print after publication. Publication without written consent may be considered if all identifying information is removed, public interest considerations outweigh the potential harm, it is impossible to obtain permission and a reasonable individual would be unlikely to object to publication. The final decision on whether consent to publish is required lies with the Editor. Authors, reviewers and editors must declare whether there are any competing interests with regard to the publication of a study. A competing interest exists when the authors’ interpretation of data or presentation of information may be influenced by, or may be perceived to be influenced by, their personal or financial relationship with other people or organizations, such as reimbursement for salaries, equipment or supplies, or a personal belief that may influence their objectivity and motivation, and consequently affect the data interpretation. This can include competing patents, grants, funding, employment, personal relationships and strong ethical beliefs, among other factors. Such conflicts must be declared, as they may affect the integrity or reliability of the science in the study, as well as that of otherwise unassociated studies in the same journal. Competing interest statements for public funding sources, including government agencies, charitable or academic institutions, need not be included. For example, if a charitable foundation sponsored the study and a pharmaceutical company provided the drugs, only the pharmaceutical company should be mentioned. Full disclosure of the competing interests is to be made in the cover letter and manuscript at the time of submission, even if the author judges that it has not influenced the work. If no conflict exists, this must also be stated clearly in the manuscript as follows: 'Competing interests. The authors declare that they have no competing interests', and all authors should confirm its accuracy. If there is a conflict, please include it in a 'Competing interests' section. Examples of conflict of interest statements include ‘The present study was supported by Jones Women's University, grant no. 12345’, ‘XY University provided a graduate scholarship to Dr Jones’, ‘The compound xyz was kindly provided by ABC Company, city, country’. Authors may be asked to confirm or update, or provide further details regarding such disclosure statements following acceptance of the manuscript. Further details regarding requirements for conflict of interest statements are provided in www.icmje.org/conflicts-of-interest. External peer reviewers must disclose any conflicts of interest that could bias their opinions of the manuscript, and they should disqualify themselves from reviewing specific manuscripts if they believe it appropriate. Should any such competing interest be declared, the journal editor will judge whether the reviewer’s comments should be recognised or will interpret the reviewer’s comments in the context of any such declaration. This section is optional. You may choose to use this section to include any relevant information about the author(s) that may aid the reader's interpretation of the article, and understand the standpoint of the author(s). This may include details about the authors' qualifications, current positions they hold at institutions or societies, or any other relevant background information. Please refer to authors using their initials. Note this section should not include authors’ email addresses or competing interests. Spandidos Publications recommend that authors refer to the minimum reporting guidelines for health research hosted by the EQUATOR Network when preparing their manuscript, and FAIRsharing.org for reporting checklists for biological and biomedical research, where applicable. Authors should adhere to these guidelines when drafting their manuscript. Spandidos Publications supports the prospective registration of systematic reviews and encourages authors to register their systematic reviews in a suitable registry (such as PROSPERO), including the registration number as the last line of the manuscript abstract. Authors of systematic reviews should also provide a file describing all details of the search strategy. For an example of how a search strategy should be presented, see the Cochrane Reviewers' Handbook. Authors must check their manuscript carefully before submission, after responding to peer-review, and when answering queries raised at the proof stage. Any errors will be faithfully transferred into the final PDF and print versions. A reprint order form will accompany notification of acceptance of a manuscript and should be completed and returned immediately. For further information, please email contact@spandidos-publications.com. After final acceptance of manuscripts, authors can choose between one of the two following options to cover for publications costs. Option 1: The publication charge is calculated based on the number of pages and color figures (per page) of the final accepted manuscript. All Spandidos Publications journals have the same fees for option 1 except for the World Academy of Sciences Journal which is free to publish. Color figures should only be submitted if intended for publication. Fees for color reproduction are calculated based on the number of pages with color at the time of manuscript acceptance. Figures may not be changed to black and white once a manuscript has been accepted. Articles become freely available 12 months after their publication in print. Authors requiring immediate Open access of articles published in our other journals must use Option 2. Option 2: A fixed charge is applied irrespective of the total number of pages or color figures. In addition, the articles are made immediately available as Open access and appear online at PubMed, PubMed Central and Europe PMC. This option complies with a number of funding bodies (see Open access section). If your institute has a Gold Membership subscription with Spandidos Publications, then your article may be published free of charge. Please check with your institute librarian or subscription manager. "Open access" articles published online can be freely accessed at the journal's website by all users. The articles are made immediately available as Open access and appear online at PubMed, PubMed Central and Europe PMC. Articles may be licensed under a Creative Commons Attribution-NonCommercial- NoDerivatives 4.0 International License, a Creative Commons Attribution-NonCommercial 4.0 International License or a Creative Commons Attribution 4.0 International License. Spandidos Publications’ publishing policies enable authors to comply fully with the public access requirements of the major worldwide funding agencies (visit here for more information). Authors must take the necessary actions to obtain this compliance, including self-archiving, utilization of Spandidos Publications manuscript deposition service and selection of Open access publication under the correct license. Spandidos Publications makes articles freely available 12 months after the publication. Authors wishing to purchase immediate Open access for International Journal of Oncology, Oncology Reports, International Journal of Molecular Medicine, Molecular Medicine Reports, Oncology Letters, Experimental and Therapeutic Medicine, Molecular and Clinical Oncology and Biomedical Reports must select option 2. Spandidos Publications will refund an article processing charge (APC) if an error on our part has resulted in a failure to publish an article under the Open access terms selected by the authors. This may include a failure to make an article openly available on the journal platform, or publication of an article under a different Creative Commons licence from that selected by the authors. If you become aware of an error in the Open access status or licensing of your article, please contact the appropriate journal immediately. Note that APCs will not be refunded in instances where articles are retracted or removed as a consequence of author error or misconduct. Neither we will be liable if delays in the processing of the article result from changes made to the authorship on the article, or in cases where delays result from editorial decisions. All manuscripts that are agency-funded (e.g. NIH, HHMI, Cancer Research UK, Wellcome Trust, the Chinese Academy of Sciences (CAS), the National Natural Science Foundation of China (NSFC), etc.) and paid for under the Open access οption will be deposited automatically by the publisher and become publicly available in PubMed Central and Europe PMC. Alternatively, agency-funded articles without Open access purchase will be deposited and made publicly available in PubMed Central and Europe PMC 6-12 months following publication, depending on the public access policy of the agency. Spandidos Publications has obtained agreements and constructed policies to enable authors to comply with manuscript archiving requirements of the following funding bodies specified in conditions of researcher grant awards. This enables authors to follow their funding body's policies on archiving without breaching their publishing agreements with Spandidos Publications. Authors are encouraged to submit the final publisher’s version PDF of their manuscript to their institution’s repository 6 months following publication, as well as to their funding body’s archive. A link to the published version on the Spandidos Publications website must be included with full citation details and acknowledgement of the journal as the original source. Authors that have purchased Open access can add the final publisher's PDF to their institutional repository and funding body's archive immediately. In addition, authors are allowed to archive their articles pre-print (i.e., pre-refereeing). Pre-print can be on author's personal website or pre-print server. If English is not your first language, you may decide to have your manuscript proofread or edited by an English speaker, prior to submission. A colleague or a professional service may do this. Clear and concise language enables editors and reviewers to concentrate on the scientific content of your manuscript. This facilitates the peer review process and ensures that your article will not be rejected based on English language alone. Spandidos Publications offers a number of Manuscript Services including an English Language Editing service, through which the use of English in your manuscript may be checked and refined. The editors of this service will focus on the spelling, grammar, clarity and style of your manuscript. For more information on this and other services, please access: www.spandidos-publications.com/languageediting. Please be aware that an author's use of this or any other service in no way guarantees that his or her submission will be accepted by a Spandidos journal or any other. Any arrangement an author enters into will be exclusively between the author and their chosen company. Using an editing service is neither a requirement for nor a guarantee of acceptance for publication. For further details, please refer to our disclaimer on our affiliated website. All contributors who do not meet the criteria for authorship should be listed in an ‘Acknowledgements’ section. Examples of those who might be acknowledged include a person who provided purely technical help or writing assistance, or a department chair who provided only general support. The involvement of scientific (medical) writers or anyone else who assisted with the preparation of the manuscript content should be explicitly acknowledged, along with their source of funding, in the ‘Acknowledgements’ or ‘Authors’ contributions’ section as appropriate. Authors should obtain permission to acknowledge from all those mentioned in the Acknowledgements section. If you do not have anyone to acknowledge, please write "Not applicable" in this section. Please note that company names and generic statements should not be mentioned in this section. Option 1: The publication charge is calculated based on the number of pages and color figures (per page) of the final accepted manuscript. All Spandidos Publications journals have the same fees for option 1.